Developing an imaging strategy for your radiology department is more important than ever. With new expectations for ubiquitous access to imaging reports and tools, a key part of the imaging strategy of the future includes enterprise-wide deployment of advanced visualization. Yet, it is critical that access to advanced visualization technology enhance — not hinder— overall productivity. To this end, the latest iterations in advanced visualization tools are designed to boost performance, quality, scalability, access, cost-effectiveness, and flexibility. End users have come to expect picture archive and communication systems (PACS) with advanced visualization (AV) already integrated— but to what extent? Access to AV tools deployed through client-side image rendering on stand-alone workstations was expensive and limited to a single user in a single department. Once the technology evolved into server-side or thin-client rendering, AV tools were streamlined into PACS. This allowed radiologists to launch 3-dimensional viewing solutions right from the PACS, resulting in significant time savings. This model, however, still required a client installation or plug-in; it also placed a heavy burden on the workstations’ processing power. “The downside of Web-based PACS is that images can’t present in 3-dimensions because you need all of the processing power at the desktop,” said Brad Levin, General Manager, North America, Visage Imaging. Eventually, we got to the current technologies — server-side rendering and “zero footprint” models — which may be today’s most efficient methods for viewing 3-dimensional images across the healthcare enterprise. In a server-side scenario, the images are processed on the servers; therefore, a case pulled up by a radiologist automatically presents a3-dimensional view ready for evaluation. “This server-based processing approach optimizes the current IT consolidation trend taking place in the hospital market, where IT management is being centralized to generate workflow productivity efficiencies and reduce total cost of ownership,” said Frost & Sullivan Principal Analyst Nadim Daher. Zero-footprint architecture enables access to AV tools through a cloud platform. Claudio Gatti and Doron Dekel, co-founders and co-CEOs of Claron Technology Inc., say zero-footprint architecture is an efficient model for enterprise-wide deployment of AV. “With zero-footprint thin clients, there is no need for any installation on the client side, the browsers deliver data, and the client then runson any browser-capable device, including tablets and smart phones. This also lowers the dependence on IT support,” said Gatti. With the Vue Cloud, Carestream offers a software-as-a-service (SaaS) approach to imaging information on a predictable, pay-as-you-go basis. This provides radiologists with access to clinical data and advanced tools as needed to aid in diagnosis (Figure 1). One reason for replacing a legacy PACS is scalability. If the legacy viewer doesn’t deliver the diagnostic breadth, scale or performance required, it may be time for a change in imaging strategy. This is what prompted Rays, a teleradiology group based in Littleton, CO, to migrate to the Visage 7 solution. “Seeking to increase efficiency by removing the need to push DICOM files to our radiologist workstations,Visage was able to meet this requirement with their streaming technology, while also augmenting the feature set of our diagnostic viewer,”said Ted Tzeng, vice president of technology at Rays. While zero-footprint models may provide scalability, there are still some obstacles with zero-footprint technology when supporting mobile applications, Gatti pointed out. These primarily involve latency between the client and server, support for both touch and mouse user interfaces,and the challenge of meeting the requirements for the wide range of screen resolutions and sizes. To overcome these challenges, Claron Technology has developed the Nil viewer, a zero-footprint AV viewer that has largely the same visualization power of earlier workstations and is accessible from any desktop, tablet, or smartphone. The company recently debuted both NilRead for diagnostic applications and NilShare for referring physician and other nondiagnostic users. The Nil app for the BlackBerry PlayBook provides one-click fast access to the image viewer running either on Claron’s NilCloud or a medical facility’s dedicated Nil server. TeraRecon also provides access to its AV tools for computed tomography (CT), magnetic resonance imaging (MRI), and positron emission tomography (PET) through its cloud-based solution Intuition Cloud. Last year, Kjaya Medical rolled out iShareScan.com, a cloud-based image sharing solution that supports on-demand 3-dimensional processing, viewing, and manipulation. The server leverages Kjaya’s gaming technology-based cloud to manage large volumes of medical data and stream Web-based advanced visualization instantaneously without transmitting the raw scan. Making images available throughout the healthcare enterprise increases demand for integration and interoperation between multiple departments inside and outside of the hospital. The integration of imaging infrastructures across distributed and heterogeneous healthcare facilities is increasing as a result of nationwide initiatives, such as the Meaningful Use (MU) program. In April, the Center for Medicare and Medicaid Services (CMS) and the Office of theNational Coordinator (ONC) for HIT added medical imaging to Stage 2 criteria for MU. Imaging is now one of 10 possible objectives doctors can put on their list of 5 objectives aimed at demonstrating MU. As hospitals integrate PACS with EHR, advanced visualization will become an enterprise-wide application using server-based processing. Visage Imaging offers an agnostic viewer that sits on top of PACS, which supports a best-of-breed model for advanced visualization,voice recognition, and electronic health records (EHR). With the integration of AV and image management systems, image postprocessing has become automated to the point that physicians can immediately interact with 3-dimensional images. 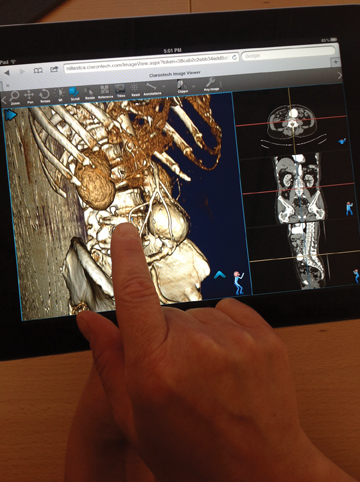 This is changing the way radiologists handle data and view images. While radiologists still rely on 2-dimensional datasets, they are increasingly viewing studies in multiplanar and maximum intensity projection (MIP), and using volume-rendering techniques. Alamance Regional Medical Center relies on syngo.via as an enterprise-wide solution that integrates imaging modalities and IT, making it possible to access and share information with clinical partners. The client-server technology can be accessed directly from a RIS/PACS,simultaneously launching the patient record in PACS and RIS with minimal loading time. At Alamance, radiologists commonly read CT angiography using the vascular package available on syngo.via, which automatically segments the major blood vessels. Alamance radiologists also use AV applications for magnetic resonance angiography where they are reading most studies using MIP and for PET/CT and SPECT/CT fusion imaging to compare currents and priors. PACS to allow radiologists or technologists to perform renderings and to eliminate the need for third-party software. Vital Image’s Vitrea Enterprise Suite (VES), version 6.2, can be customized for specific enterprise needs. The company’s viewer, VitreaView version 6.2, is a universal viewer that enables access to images from disparate databases, providing one integrated, universal viewer. Another growing trend involves the introduction of more powerful cardiovascular imaging, virtual colonoscopy, and whole-organ AV applications. The continued proliferation of imaging for diagnosis and treatments will lead to more studies that involve dual-source scanners and multispectral imaging. Consequently, there will be too much data for workflow to focus on the examination of axial, coronal, and sagittal images. Instead, workflow will need to become anatomy- and pathology-driven. In fact, a number of segmentation features are already automated. Claron Technology’s Within sight Framework (WIF) toolkit provides technological support for developing applications for segmentation, especially for CT (Figure 2). TeraRecon, Inc. also provides a suite of tools designed to allow physicians to approach imaging on an organ- or disease-specific basis. The suite includes lobular decomposition, an analysis and segmentation tool that allows users to select the volume of interest, the trees related to it,and to partition the volume into lobes or territories; volumetric histogram, which supports analysis of a given volume of interest to research into disease processes; motion analytics, providing a 2-dimensional representation of a 4-dimensional process. There is an inherent burden in processing large-volume datasets to produce 3-dimensional and 4-dimensional images. Another effective strategy for boosting performance and overcoming latency is using a CPU-based client. CPU-based computing does the heavy lifting to manage large data loads at fast speeds and support enterprise-wide and web-based volumetric rendering with affordable, off-the-shelf computers. Additionally, CPU-based engines are able to lower costs for end users because they do not require expensive graphic cards. One CPU-based AV software that is gaining notoriety is HDVR Connect, a high-definition volume-rendering solution by Fovia. HDVRConnect is an agnostic AV solution platform that runs both locally and remotely on several client-server configurations, such as Windows servers with Mac and Linux clients, Mac servers with Windows clients, and Linux servers with iOS clients. It is designed to enable end users to visualize extremely large datasets without down sampling or sampling a subvolume. “HDVR Connect takes full advantage of the trends in imaging and computing — larger datasets, bigger projection displays, multi-core processors, multi-threading, multi-CPU environments, and server-side rendering, without compromising quality or performance,” said Daher. Physicians and surgeons at Teikyo University School of Medicine in Tokyo, Japan, are deploying Fovia’s HDVR Connect software to stream AV applications on a mobile, multi-touch platform, allowing them to query and review data during surgical procedures. Fovia also offers HDVR Connect SDK, under which OEM vendors can use their own proprietary user interfaces. It also supports anOEM’s proprietary algorithms for specialized segmentation visualization. BRIT Systems natively integrated Fovia’s HDVR technology in all of its image viewers and PACS workstations, including BRIT’s Vision Viewer, PACSView, BRIT Lite, and WebWorks (a browser-based viewer). The integration provides physician users with 24-hour remote access to interactive advanced visualization. Intelerad also integrated HDVR to boost 3-dimensional performance and speed for its distributed radiology solutions. “With the increasing amount of data acquired by modern modalities and the growth of teleradiology, embedded high-performance volumetric rendering is a must have for all radiologists reading cross-sectional data — whether from local or remote workstations,” said Rick Rubin, Chief Engineering Officer at Intelerad. With the increased accessibility of AV for all physicians, 3-dimensional imaging is becoming more interactive for treatment and analysis. Qi Imaging’s QI solution uses PhyZiodynamics inVivo supercomputing technology to enable true fidelity 4-dimensional imaging —3-dimensional imaging in motion — and serves as a gateway to 5-dimensional imaging, also known as functional analytics of motion. The system allows users to navigate interactively with a beating heart, contrast-perfused brain tumor, and other anatomy. Deploying AV across the enterprise not only lowers the overall cost to the hospital network but also adds value to the radiology report. Thus, while radiologists and other specialists stand to gain from ubiquitous access to AV tools, the referring physicians will benefit equally, if not more, from a robust clinical report. Ultimately, referring physicians have a choice. They can review patients at different hospitals on multiple viewers, which results in a disjointed and inefficient experience. Or they can have one viewer simplify the workflow. Whether a system is server-based or CPU-enhanced, it should be capable of providing images already processed in 3 dimensions, presegmented, generated within the hanging protocol, and delivered immediately to the doctor’s fingertips. This represents a dramatic departure from the way radiology studies have been managed and may present a vast improvement in the delivery of care, positioning the patient as the principal beneficiary. Siddiqui KM. Advanced visualization: Making the right choice. Applied Radiology. 2008;37(suppl):15–18. 3D advanced visualization for all. http://www.expresshealth care.in/inimaging2012apr/inimaging2012april07.html. Updated April 7, 2012. Accessed May 31, 2012. 3D tools advance enterprise wide. Appl Radiol.